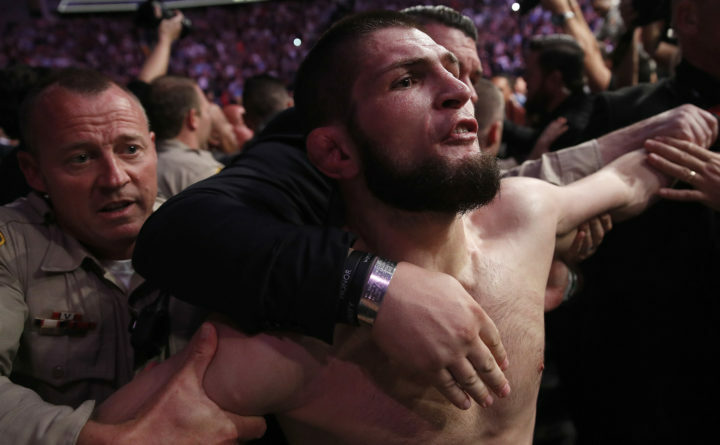 Khabib Nurmagomedov is held back outside of the cage after fighting Conor McGregor in a lightweight title mixed martial arts bout at UFC 229 in Las Vegas on Saturday. Nurmagomedov won the fight by submission during the fourth round to retain the title. The teammate of Conor McGregor who was the target when Khabib Nurmagomedov shockingly leaped from the cage at UFC 229 is denying that he incited the Russian fighter with an anti-Muslim slur. Dillon Danis described reports that he made the comments as a “smear,” and he said Wednesday that an official investigation into the ensuing melee would vindicate him. Danis, McGregor’s jiu-jitsu coach and an MMA fighter in his own right, was working Saturday as one of the Irish fighter’s cornermen when Nurmagomedov punctuated his successful UFC lightweight title defense by climbing out of the Octagon and jumping into the crowd seated nearby. After being led away from the skirmish, Nurmagomedov had his $2 million purse withheld by the Nevada State Athletic Commission pending an inquiry into the incident, and three of his teammates, some of whom got into the cage and attacked McGregor, were arrested, then released when the latter declined to press charges. According to a report Monday by TMZ Sports, which cited a “ringside witness,” Danis had enraged Nurmagomedov by calling him a “f—-ing Muslim rat” toward the end of the bout. The witness told the website that Nurmagomedov, a practicing Sunni Muslim, “shot a death stare right at Dillon” between the second and third rounds after hearing some of the insults Danis was allegedly hurling at him. In an update to its report, TMZ noted that representatives of Danis had told the website that he “absolutely did NOT fire the slur” at Nurmagomedov, and that “the witness we spoke with is dead wrong.” However, TMZ claimed that it spoke to “multiple groups of people who were sitting very close” to Danis, who insisted that “they heard him shouting insults” at the Russian. In a post-fight news conference on Saturday, Nurmagomedov apologized for his behavior but wondered aloud why more wasn’t being made of what he saw as unacceptable comments McGregor made during the pre-fight buildup. While meeting with Nurmagomedov on Wednesday to offer his congratulations in person, Russian President Vladimir Putin said that the fighter’s post-fight actions were unfortunate but also understandable, given the goading he had been receiving.